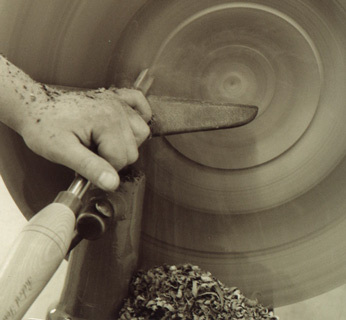 The work on the turning lathe requires a tremendous amount of precision and an experienced touch with the sharp chisel that is applied to the rotating piece of wood. Long curly clippings fly up as the inner beauty of the wood comes to light, layer by layer. Holger Graf`s excellent professional education in carpentry as well as wood turning set the foundation for his art. His technical know-how and his use and understanding of the unique texture of every piece of wood lend his pieces their dynamic form.